Whenever we look at a familiar and typical Dutch painting from seventeenth-century Holland, such as Vermeer’s View of Delft (The Hague, Mauritshuis) or Jacob van Ruisdael’s Windmill at Wijk (Amsterdam, Rijksmuseum), we are immediately catapulted into a world that still looks familiar. In Vermeer we see the stepped gable houses, church towers, and familiar southern entrance to the city of Delft, the Rotterdam gate, which has remained fairly constant in appearance in that well-preserved city to this day. And surely there is no greater symbol of “Dutchness,” then or now, than the windmill. Though many of these once-functional structures have been converted today into picturesque housing instead of performing their earlier practical industrial purpose, we still find them dotting the flat landscape of the modern Netherlands. In similar fashion, Ruisdael’s View of Haarlem offers us that characteristic Dutch panorama of flatness and expanse, presenting the typical mixture of urban density with countryside cottage industry—here, specifically, the bleaching fields for Dutch linen, a staple of Haarlem in the seventeenth century—that one can still glance through the speeding windows of an efficient Dutch train. Despite this note of the familiar, I want to suggest that these very subjects were painted with a strong consideration of their original Dutch audiences. What looks so typically Dutch was chosen precisely in order to define Dutchness to the Dutch themselves at the time that these paintings were made, early in the second half of the seventeenth century. This moment coincided with national independence and autonomy after centuries of rule from distant Habsburg (and Catholic) Spain, ratified by the treaty signed at the Peace of Westphalia in 1648. After a protracted independence struggle, often called the Eighty Years War, akin to the American War of Independence about a century later, the seven northern provinces of what had been calling itself the United Netherlands achieved both political and religious autonomy from the Spanish crown (the remaining ten provinces, some of them partly linked through the common language of Dutch—also called Flemish in the south—ultimately became the modern nation-state of Belgium after 1830). The Dutch Republic or is often called Holland after its largest and most populous province, though that would be akin to calling the United States after Texas or California. The United Provinces is an equivalent and more appropriate name for the Netherlands. To build a national identity is never easy and rarely emerges clearly in its formation process, compared to the insights gained in hindsight. Consider for America the issue of which bird to use as the symbol of the nation: Benjamin Franklin opted in favor of the turkey, but was overruled in favor the more traditional image of strength, the eagle, which now graces our coins and seals. Although the Netherlands was emphatically intending to remain a Republic of fairly autonomous provinces and leading prosperous cities, headed by Amsterdam, the new nation also managed, then as now, to support what would become a hereditary monarchy, descended from the House of Orange and its revolutionary leader, William the Silent, equivalent in Dutch history to George Washington for the U.S. The Dutch royal leader was initially designated not as a king but rather as a stadhouder, that is literally a “place-holder” or “lieutenant,” although eventually royal status was granted, and the last three monarchs of the Netherlands have been beloved queens, highlighted by Wilhelmina during the resistance period of World War II. This delicate politics meant that The Hague, traditional capital of the Netherlands (whose very name is shorted from ‘s-Gravenhage, or “hedge of the duke”), never attained the status or grandeur of court centers in rival nations, such as Spain, France, or England. Ironically, the aspiring Dutch court artists, such as Gerrit van Honthorst, made their names abroad; in his particular case, both England and Copenhagen were more receptive sites for royal commissions. In similar fashion, the Dutch international style of architec-ture, marked by a blocky classicism, blossomed more fully in Scandinavia and the Baltic region than in its homeland, and it has been little studied by historians of architecture, even in the Netherlands. Some circular feedback is happening with these phenomena. The images that we associate with Holland (to be quite specific about the region that produced and consumed most of the easel paintings of the seventeenth century) are precisely those that look like the countryside and the city views themselves, as depicted by Ruisdael and company. These works have been celebrated and studied (Philadelphia staged a wonderful retrospective of Jacob van Ruisdael in 2005) in books and exhibitions alike. These pictures are seen as truly and typically “Dutch,” and in turn they crowd out other works without the same characteristic features, or works that seem more linked to international (sometimes court) movements in seventeenth-century (often Catholic) art. There were in fact a group of Dutch painters, now labeled (originally with a pejor-ative taint) as the “Italianate landscapists,” whose work resembles the glowing skies, hillside settings, and pastoral populations most often known to art history through the work of Claude Lorrain and other painters who based themselves on the Roman campagna as a home setting. You will not know their leading practitioners (Jan Both; Nicolaes Berchem) unless you are a geeky specialist in Dutch art, even though Claude Lorrain could reasonably be claimed, especially from an English art history viewpoint, as one of the most influential landscape painters ever. Some Dutch painters adapted the golden sunsets into their own more “typical” riverside, flatland settings, populated with cows and marked at the horizon by a familiar church steeple. The fusion led to a powerful new Dutch landscape painting by a more celebrated and often studied artist: Albert Cuyp (indeed, both a major street and a grocery store chain in Amsterdam bear the name of Albert Cuyp). But about the “Italianists” almost nothing is familiar to casual art-lovers; only recently has the Rijksmuseum even begun to hang their works amidst the more celebrated Ruisdaels, Hobbemas, and van Goyens. We find the same situation concerning portraits. 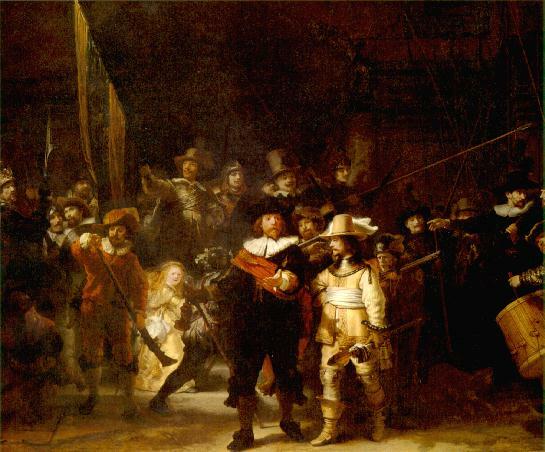 The standard surveys of Dutch painting feature works like Rembrandt’s Nightwatch Militia Company (Amsterdam) or Frans Hals’s Militia of St. George (Haarlem), both group portraits of private army reserves, musketeers or crossbowmen who served as an emergency army for national defense, despite the de facto state of peace that prevailed in much of the country even before the Peace of Westphalia was signed. Additionally, group portraits of regents, such as Rembrandt’s Drapers Guild (Amsterdam) or Hals’s Regents of the Almshouse (Haarlem) represent in literal embodiment the forces of democracy rather than royalty; the enactment of authority is provided by civic elites in a corporate and professional structure rather than resulting from noble birth or blood descent. Indeed, scholars and laymen alike have been known to gush about the egalitarianism implicit in the relatively non-hierarchical arrangements of the figures in these group portraits, where only slight gestures or subtle placement suggests greater authority or official roles for some members. What we ignore by featuring these images is the official court portraits of Dutch royals or their own private and glorious architectural spaces, highlighted by the exclusive “Orange Salon” (Oranjesaal) in The Hague, a shared culture redolent of both the pageants and the allegories celebrated all over Europe and designed by impresario artists like Rubens. We also tend not to remember that in one of the first European countries to practice even a measure of religious toleration, the dominant Calvinist creed of the Dutch Reformed Church was supplemented by an active, if covert, Catholic art. Indeed this minor key of Dutch visual culture was most vividly represented by none less than Vermeer, whose Allegory of the Catholic Faith (New York, Metropolitan Museum) is ignored in favor of his isolated bourgeois women in domestic interiors, but it is the visible manifestation of the artist’s own conversion to Catholicism when he married. Not only does the basic naturalism of Dutch art seem inimical to such allegory in the first place, but its recondite symbolism seems fully at odds with Vermeer’s sharp focus on the optical. Yet the woman in this image crushes the serpent of evil and rests her foot on a world globe as she raises her gaze up to heaven amidst a chalice and a crucifix on a table. Similar religious subjects not only emerged from the Rembrandt entourage—albeit without the explicit Catholic imagery—but from the active workshops in Utrecht, the former bishopric of the Netherlands. There a tradition of Catholic subjects, such as Ter Brugghen’s New York Crucifixion or his Chicago Denial of St. Peter, formed a pictorial staple. And there were a surprising number of religious subjects in the output of later Dutch painters, such as Jan Steen, even though this kind of imagery fails to conform to the standard assumptions of what Dutch painting contributed to the overall history of art. From where do we get this corrected or even censored vision of Dutch art? In part, our vision of Dutch painting emerged from the eyes of its most celebrated imitators and connoisseurs, who used Dutch art as a model for their own pictures. Probably the most famous celebrators of Dutch art were our own beloved Impressionists. It was an art critic and friend of the Impressionists, Thoré-Bürger in Paris, who is most responsible for the rediscovery and enshrining of Vermeer within the pantheon of great painters. Bürger, whose real name was Etienne Thoré, made Vermeer into a personal crusade during the 1860s, especially championing the View of Delft, which he believed transcended in its unadorned naturalism any earlier dependence of what he regarded as Renaissance-era allegory and medieval mysticism, trends that he regrettably still found dominant in the Academy of the later nineteenth century. Hence he celebrated Dutch mimesis and choice of ordinary subjects for painting and supported contemporary outdoor painting, the very wellspring of Impressionism in the succeeding decades. Every age finds the history that corresponds to the values and issues of its own times, and in the later nineteenth century Vermeer’s View of Delft rather than his Allegory of the Catholic Faith was what got promoted. Thoré’s outlook was followed in his own day by other important observers. About a decade later Eugene Fromentin, a painter, wrote a celebrated book, The Masters of Past Time (1877), which established a view of Dutch painters as Impressionists avant-le-lettre. Several of the works listed in this essay are linked to actual images. All you need to do is click on the link to view it. However, the links will open a separate window. If you have a pop-up blocker active, you will likely need to disable it temporarily to view the images.